This is a Brand New replacement Remote Head Key fob transmitters for select Ford vehicles that comes complete including battery. 100% new, never used remote, uncut blade. This is a Keyless2Go replacement remote head key fob that will work and function just like the original one. This remote head key fob must be cut and programmed in order to function. A website link to free DIY programming instructions will be provided with every order. Both key and remote portion of this remote head key must be programmed. In order to perform the DIY programming for the key you must already have 2 working unique (not cloned) keys that start your vehicle. 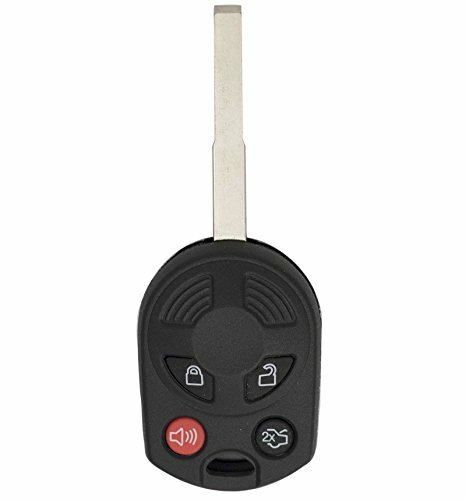 If you only have 1 or no keys for the vehicle then you will need to get this remote key programmed by a qualified auto locksmith or dealership. Also, your new unprogrammed key must be cut prior to performing this procedure. In order to perform the DIY programming for the remote, you need to have 1 working key. Please be sure to check the vehicle compatibility guide below. Please make sure that your original remote has the same exact buttons on it. If your vehicle has a plastic collar around ignition, this key WILL NOT FIT. This key WILL NOT WORK if you have smart key system or proximity system. There are 3 different types of keys possible for Ford Fiesta. This remote key will only work if your original key looks like the one on the picture. This is a brand new replacement remote head key fob with uncut key blade for select Ford vehicles. Please check product description below for vehicle fit guide. New complete working remote key with all electronics and batteries included plus FREE tech support.